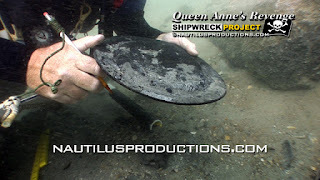 Did Blackbeard's ship's cook serve his prisoners from this pewter plate found on the Queen Anne's Revenge - Blackbeard shipwreck site? The Queen Anne's Revenge was found by Intersal, Inc. in November 1996. From the Nautilus Productions LLC stock footage collection. https://www.youtube.com/watch?v=eVzcMXs5hoo.